In our Monkey Business series, we sit down with creative internal communications pros, HR top-performers and email gurus to get the best tips and tricks to engage employees, fix your culture, and help you improve business performance. As an internal comms pro, you know how hard it can be to make businesses understand the importance of internal communication and demonstrate the connection between employee engagement and ROI. But the importance of internal communication is increasing rapidly as businesses are beginning to realize they need to invest in effective internal comms to boost employee engagement. According to Gallup, employee engagement at most organizations is extremely low, amplifying the importance of internal communication in organizations. With millennials and Gen Z entering the workforce, organizations are starting to take employee engagement more seriously in order to attract and retain a multigenerational workforce. “There is a clear change in the way the younger generation work and their connection to technology is generally not seen in other generations,” says Jenni Field, Communications Consultant and Director of Redefining Communications. 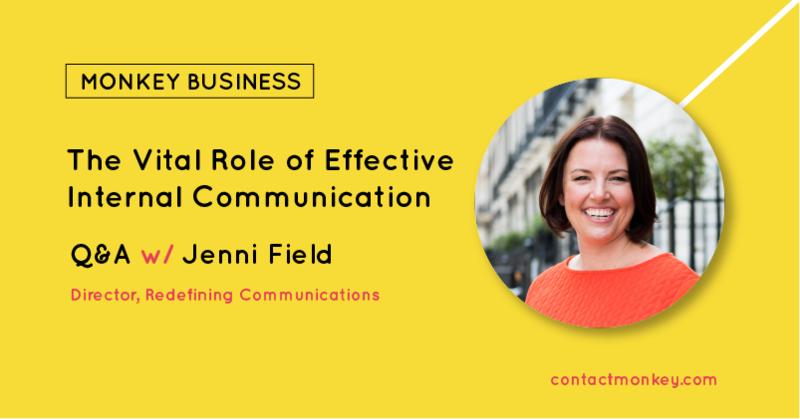 Jenni has worked in communications for over 13 years and specializes in helping organizations understand the importance of internal communication in helping drive better business results. Jenni has worked in a variety of sectors including the public sector, defence, advertising, retail and hospitality industries. She has set up global communications functions, specialised in media relations and internal communications and has helped companies through major change programmes, digital adoption challenges and streamlining their PR efforts for the best results. Jenni is also the co-founder of The IC Crowd, which she started with internal comms pros, Rachel Miller and Dana Leeson, to support internal communicators all over the world and help bring a network of communicators together. We recently had a chance to catch up with her to discuss the importance of internal communication, the problems with engaging millennials in the workplace and the challenges faced by internal comms pros. Let’s get into it! 1) How did you end up working in internal communications? What captivated you about this profession? I always wanted to work in PR as I had a keen interest in business. I pursued a degree in Marketing and after university, my first job was as a communications assistant in local government. I have specialised in various areas within PR but internal communication really called me because it mattered to people who you were with everyday and you could be really creative with your approach to the organisational challenges. 2) How would you define internal communication? And what makes someone a good communicator? A good communicator is someone who is clear, consistent and considerate. 3) You’ve worked in-house for many years and now you’re heading your own consultancy. What led you here? And because you’re a Simon Sinek fan, I’d also love to ask, what is your WHY? This question made me smile. I was often told to give consultancy a try but I never felt I was ready. In my last in-house role, I was able to develop other skills within communication so it felt like the right time to give it a try. I’m incredibly passionate about being a professional communicator and being a consultant allows me to help people be the best they can and I really enjoy that. I always say that I do what I do because I want to change the world – nothing like a big ambition! 4) The world of IC is a vibrant, highly engaged, global community. How important do you think it is for IC professionals to have a global support system? And is this what motivated you to start the IC Crowd? It’s incredibly important. The network for internal communicators is a really safe place and one I would be lost without. My work with the Chartered Institute of Public Relations (CIPR) has given me a really broad network across PR and I have found mentors, coaches and friends through it. Most people have tried to do what you are doing so the network is a great sense check for the work you’re doing. We created The IC Crowd because we want to help people succeed. We all wanted there to be a place for people to share and connect and The IC Crowd was our solution. The Big Yak was created to help those chatting on Twitter come together in real life and the response to ticket sales always astounds us. 5) Do you think many IC pros tend to focus more on the tactics rather than on a strategy? Unfortunately the pace of business is not allowing IC pros the time to stop and think – we need to get better at pushing back on leaders too. We can be strategic with the tactical but we need to start with insight – if you don’t have a strategy, at least do some research into what people need and want. Without that you’re not doing what is right for the organisation and the people. We can move away from this in a few ways. As I said, we need to push back more. I have set up several internal communication functions and each time, I tell my leadership team it will be three months before you see the strategy – we need to have time to listen. We also need to recognize that we are professional communicators and we need to invest time in ourselves to demonstrate credibility. In doing this, we signal the importance of internal communication and what we are doing and that it isn’t something just anyone can do. 6) Given the rapid technological disruptions happening around us, how can IC pros deal with change and how can they engage millennials in the workplace? Read Hilary Scarlett’s book about neuroscience and organisational change – that’s the best advice i can give as it helps you help leaders understand the impact of change on human beings. We need to be clear on what is change and what constitutes normal business cycles – it is easy to think of everything as a change programme but this won’t be sustainable for a small team. Engaging millennials in the workplace is a good topic. You have to believe in generational theory to have this debate and this is tricky to prove. However, there is a clear change in the way the younger generation work and their connection to technology is generally not seen in other generations. If you watch the interview with Simon Sinek on millennials and read the book on organisational change, you’ll easily see how the two are linked. Our need to get the work done to the detriment of social connections at work is what is having the impact on engagement and relationships. 7) What is one piece of internal communications content you’ve seen or worked on that you’ve absolutely loved? I’m really proud of the work I did to launch a new company strategy. It was the first time I was able to work with the Board on messaging, shape a conference agenda and work on content and scripts and create toolkits to see it embedded through the business. I love campaigns and content that demonstrate the culture of an organisation, so anything that clearly signals that is a winner in my book! 8) What do you wish you knew when you first started your career in internal comms? I wish I’d known about networks and industry bodies or experts. I still remember Melcrum calling me and I had no idea who they were or what they did and I had been working in communications for about 4 years at that point. 9) A lot of IC professionals talk about getting executive buy-in and a seat at the table with the C-Suite. What, in your opinion, is an effective path towards gaining the “Trusted Advisor” status with the C-suite? Be consistent, be an expert, be trustworthy and display goodwill. I was once told my opinion was not enough in the boardroom. So I completed the CIPR diploma in internal communications. Now I had the facts and theory to back up what I was saying and I was able to demonstrate real expertise. Don’t get hung up on having a seat at the table. Influence those who do have a seat and work hard to earn one there if you think it will help you achieve what you need/want to do. 10) ContactMonkey is all about creating beautiful emails and tracking employee engagement via emails. What’s an internal email you’ve received that you actually loved? What makes a good email? I like anything that breaks through the noise and makes me laugh/smile or gasp. Simplicity is best for me. I think a good email is one that is clear. It should clearly tell me what do you want me to do and by when. 11) Lastly, what do you think are some of the future trends IC pros should keep an eye out for in 2019? I think we will see trends continuing to focus on purpose and people. Wellbeing is continuing to rise on the agenda and i think this will come over to internal comms as a link to the social connections we make through the way we communicate at work. I also think we are starting to see a better understanding around the importance of internal communication. A lot of my clients are business leaders/operations directors etc. rather than communications teams so this is really encouraging. The measurement debate will continue and I hope the research we are doing through CIPR Inside will help us move that conversation forward. Start Measuring Your Internal Comms Via Our Email Tracking Tool! Let us know what you thought of our chat with Jenni. If you want to add to the conversation or share your internal comms tips, tweet at us with #MonkeyBusiness! Want to learn how to track employee engagement via email using ContactMonkey? We can set up a personalized demo for you and your team. Just click on the button below to book your demo!